On November 8, a very large and powerful storm, Typhoon Haiyan, struck central Philippines destroying towns and villages. Haiyan is one of the strongest storms ever recorded. The storm was estimated to have average wind speeds of over 300 kph (180 mph). 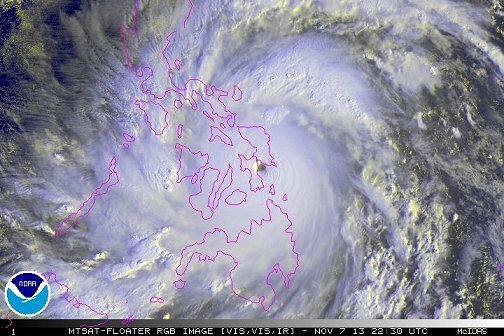 Along with the strong winds, Haiyan brought very heavy rains and a massive wall of water (referred to as the “storm surge”) which was over 13 feet (4 meter) high at places. The storm caused an immense amount of damage. Large areas were flooded, homes were destroyed, buildings were flattened, trees were uprooted, and power lines were destroyed. People were left homeless without clean water, food, and medicine. One of the worst hit cities is Tacloban on the eastern coast of the Philippines (see image). According to the United Nations, over 10 million people have been affected by this storm, and over 2,000 people have died. The government of the Philippines and many other nations are trying to help the people. Haiyan struck some parts of Palau before it hit the Philippines, and made its way to Vietnam after the Philippines. However, it did not cause as much devastation in these two other countries as it did in the Philippines. Typhoons are very large storms with winds swirling around at high speeds. The center of the storm is called the “eye” of the storm, and is actually quite a calm area. The wind rotates around the eye of the storm in one direction. When the storm reaches land, it pushes up a large amount of ocean water onto the land. This wall of water (called a storm surge) can cause flooding. The Philippines is named after a Spanish king, Philip II, from the 16th century. It is a country of islands (over 7,000), mountains, rainforests, hot & humid climate, coconuts, mangoes, volcanoes, typhoons, and lots of languages! Filipino is one of its official languages and Manila is its capital. A local dance is the tinikling – two people tap bamboo poles while some people dance stepping over the poles. An inexpensive form of public transportation is a ride on jeepneys. They are brightly decorated covered jeeps and are usually packed with passengers. 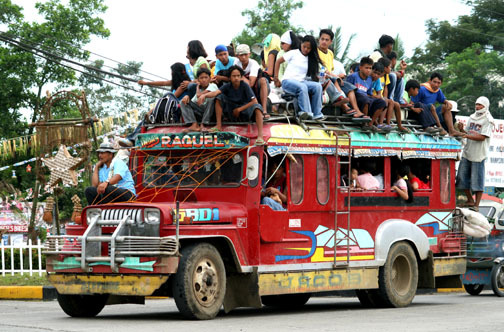 Jeepneys were originally created from the jeeps the American troops left behind in the Philippines after World War II. Here is a video showing Typhoon Haiyan. Here is a video showing some folks doing the tinikling dance. Here is a National Geographic video about hurricanes.